When you dab on perfume and other fragrances, it can add an air of luxury to an outfit of tee shirt and jeans, or it can glam up a day at home. A subtle waft of flowers, fruit or spices can make others around you sit up and take notice of your fabulousness when your are standing in line for coffee or sitting at a table. While the air of luxury can be bottled in a bottle, the bottle itself can give you that luxe vibe. A pretty perfume bottle sitting on a bureau or dressing table can make you feel feminine and luxurious when you reach for it or when it just sits prettily in a room. 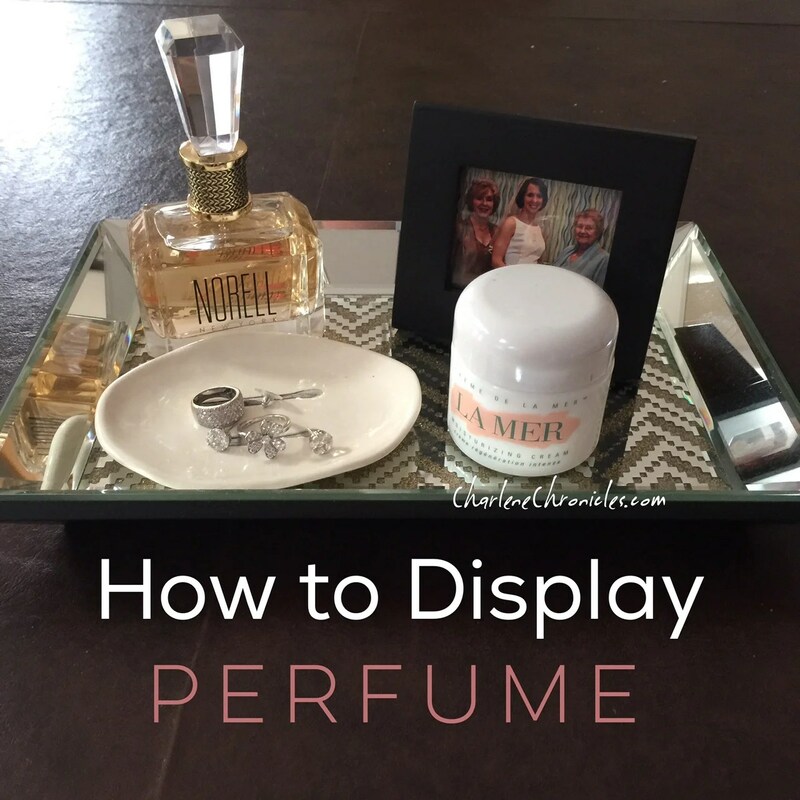 Here is how to display perfume at home. Find a gold or silver mirrored tray. It can be any size but make it large enough to display the following items: a pretty hairbrush, a mini tray for earrings and rings, a pot of beauty cream and a powder puff. Add a small guilded frame of something special – perhaps a quote or a picture of something or someone special. Finally, add a luxurious and pretty bottle(s) of perfume or fragrances. One of my new favorites is the fragrances called Norell New York and its faux diamond topper that sets off rainbows and sparkles when the sun hits it. Do you have a special places for pretty things?